Look back at 30 years of Star Wars in this retrospective Anniversary Blowout! 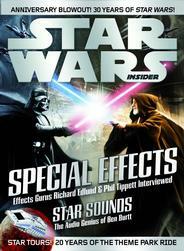 Featuring an exclusive insight into the world of Special Effects with in-depth interviews with Richard Edlund and Phil Tippett. Plus, take a tour of the theme park ride Star Tours and hear what audio genius Ben Burtt has to say! Available in Newsstand and Previews Exclusive cover editions! NOTE: This is a preorder slated to ship in January 2008 (subject to change without notice by the publisher). Your credit card will be charged when the item is ready to ship to you.